What is Gold Bees or Gold ETF? Gold ETFs are open-ended mutual fund schemes that will invest the money collected from investors in standard gold bullion (0.995 purity). The investors' holding will be denoted in units, which will be listed on a stock exchange.They provide returns that would closely track the returns from physical gold in the spot market. Gold holds its own in any investment evaluation on its strengths as a hedge against inflation, value in the event of political uncertainties and its traditionally negative co-relation with other asset classes such as stocks, fixed income securities and commodities. The value of goods and services that gold can buy has remained stable unlike currencies that have seen significant fluctuation. A study spanning a 400-year period has shown that the basket of goods and services that gold could buy over the period has remained the same. The 35 per cent return that gold has delivered in the last one year and 170 per cent absolute return in the last five years is not par for the course. In the period 1970-1982, gold prices had a compounded annual growth rate (CAGR) of around 21 per cent while inflation grew by 14.1 per cent over the same period. But in the following 23 years, inflation grew by 7.6 per cent while gold prices grew by 7.78 per cent. There are enough reasons why gold should be included in any investor's portfolio.Investing in gold ETFs will give the investor all the advantages of investing in gold while eliminating drawbacks of physical gold - cost of storage, liquidity and purity, among others. Gold ETFs allow investment in gold in small denominations, which makes it easier for the retail investor to participate. On the secondary market, the minimum lot is one unit. This enables the investor to accumulate units over time and reap the benefits of rupee cost averaging. The units can be redeemed either from the fund directly or from the market. 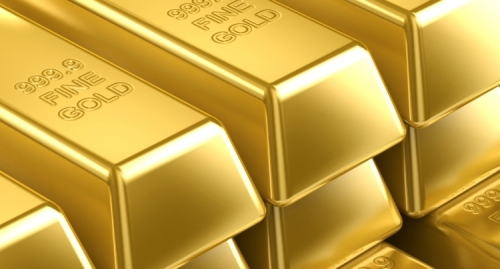 How will I invest in Gold ETFs? Just like you invest in shares. You will need to have a demat account. These Gold ETFs are listed in NSE and the daily movement in their prices can be checked online like the way you keep track of your equity portfolio. The following picture would clarify about different options available gold investing. The picture clearly shows investing in Gold ETF is better than other options. Even Quantum Gold ETF is one of the better funds available to buy gold amongst the other Gold ETFs. It is also listed on NSE. It is better because it has given better returns relative to other funds replicating gold prices the closest. It has very minimal tracking error. Can any one Say the brokerage for ETF? Is this just like equity brokerage? Can it be traded intraday? Yes, the brokerage for ETF is just like equity brokerage. It can be traded intraday, though not advised. @ you can purchase gold etf and keep it in your DP account, just like any other shares. Physical gold is for jewelry purposes and ETF is for investment. how can i purchase gold from bse/nsc ? @ to purchase gold bees from bse/nse, open an dmat and trading account with a broker. you cay buy as low as 1 unit. you can invest 10-15% of your portfolio in gold etf. you could use google translate too to read it in Hindi. If you find it difficult use the contact page, I would send it. Shall i start an sip in it or should i go with a lump sum investment. I currently have 20 K.
@ Reg reliance gold etf, you could start an sip, instead of lump sum investment. Also , limit your exposure to gold ETFs to 10% of your portfolio. If you have any other queries, pl post them or use the contact form. I wish to invest Rs. 100,000 in gold for 25 days. Am expecting 3-4 % return. is it advisable to do. and what will be the brokerage charge per lot on purchase and sell ? SIR>> I m quit young in share market will it be safe for me to invest in gold ETF. and my second question is what difference it make if I may Gold BeES or HDFC Gold ETF or some other because as per your suggestion return is based on actual gold price and how all Gold ETF is different. It is advisable to invest for short term like 25-30 days. Having said that, gold is heading higher, and one could invest 10% of one's portfolio. You can invest either in Gold , but limit your exposure to 10% of your total portfolio. You can invest in Gold Bees or HDFC gold Etf, there is not much difference. When gold goes up or down by 100rs, the price of the above funds go up/down by similar amount. Pl use the contact form, if you need further clarification. contact a stock broker for opening a demat account. can gold etf be redeemed into physical gold at some later time? No, gold Etf cannot be redeemed into physical gold. But, one could just sell the units any point of time and purchase gold/jewel. The price difference won't be much. IF AN GOLDBEES ETF OR ANY OTHER ETF GETS SHORTED . THAN WHAT WILL HAPPEN . CAN I GIVE DELIVERY OF OTHER ETF KEPT IN MY DP. If any ETF is shorted, you can give the delivery from your DP account. is it right time to buy goldbees........or i wait for right price. You could wait for 10-15% correction. Is it right time to invest in gold ETF. One can wait to invest in Gold funds. 10-15% correction possible from these levels, though one cannot time it. Invest only 10% of your total portfolio. HDFC gold and Gold bees are better of the lot. My broker advice me to buy 100 gms gold bees.He says that then i can use it for comoddity market trading.He suggest me to buy or sell same quantity in comodity market.Is this safe for me. @ You can buy gold bees as investment only. Avoid using it for commodity market trading. Even while buying Gold Bees, buy in small quantities every month, instead of buying in bulk quantity. Gold ETF is a generalized name. Gold Bees and similar others like reliance gold, hdfc gold are also called Gold ETFs. Sir, why there is price difference in 1gm gold in spot market and goldetf. The gold ETF comprises of Gold 995 (Fineness) and its NAV varies slightly due the variation in pure gold price and the cash component in the fund. Hence the difference in the spot price and the NAV. are investment if gold etf beneficialfor lond term only or one can use it as short term instrument as well? @ Investment in gold ETFs is beneficial for long term only. It is better to avoid trading for short term gains. Can i buy ETF's if I don't have an DEMAT account? ETFs are listed in stock exchanges and you need an Dmat account to buy and sell them. Instead one could go for gold mutual funds, which don't need dmat and trading accounts. If you less aware of stock markets/ Dmat account, then you can go for systematic investment plan in Gold mutual funds. You can invest as low as 500/1000 every month. If you have any other queries pl use the contact form, will be glad to help you. I liked this all i am also interested investing into gold and silver. i wanna invest 1 lac how to invest and where to invest. pls suggest me. investment is very important for me this time. I am just investment starter and would like to invest 15% in gold HDFC ETF. Is it right time or shall i wait? before investing in. pl keep in mind, gold has already gone up 6-7 times since last 10 years. you can invest in a systematic way(fixed amount monthly) and limit your investments to 10-15%. Thanks for the nice information about Gold Bees. I have been following your posts from 2009, got good returns from Gold. yes, goldman sachs gold bees is 2384(friday price) and today's rate is 2442. The 26000/tola is today's rate. Yes there is difference in gold bees and market price. You can purchase gold bees 20 shares. After 5 months it cannot be changed to gold but you can sell it and with that cash you can buy gold. suppose after 5 months if it is 25000(10 shares), the market rate would be around 27500 per tola( the difference would be maintained). On the other hand after 5 months if it is 23000, the market rate would 24500. You have to pay the extra amount. The higher price is fixed by the jewellers and we cannot avoid that.suggestion would be to buy 22 shares to make up the difference. you can buy 5/10 shares as per your convenience. Hello Rajesh. I have an SIP in Gold - Reliance Gold fund for the past year. Now my investment manager is telling me to stop it as it has started going in negative. They have suggested shifting to a new Reliance Fund and restarting the SIP in SBI fund. Please advise. 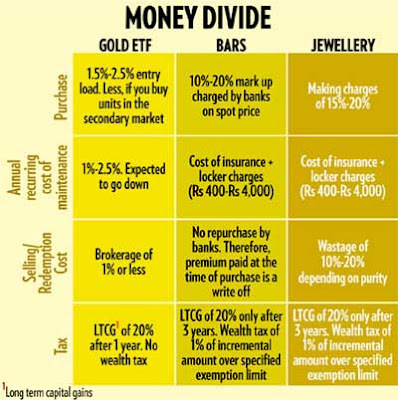 Also which is better at this time - Gold mutual fund or Gold EFTs ? Thanks. If you still want to invest/continue to invest in gold, gold mutual funds are better since you can invest fixed amount (say 5k) which is not possible in Gold ETFs( where you have to buy 1 or more units). Also there is not much benefit in switching from one fund to another fund. Which is better Gold funds or Gold ETFs? Could anyone please let me know which is the best out of Goldman Sachs Gold Fund, Reliance Bees and Quantum Gold?